Herring Kalua, far left, leads the dedication of the marker honoring Akoni Pule on July 7. Kalua is joined by, left to right, NKCRC executive director Christine Richardson, board member Bob Martin, and Sarah Pule-Fujii, Lena Kapeliela and Margaret Kaoo, daughters of Akoni Pule. Photo by Megan Solis. For the many visitors and newcomers who have wondered about the name of the coastal highway that leads from Kawaihae to Pololu, the mystery is over. 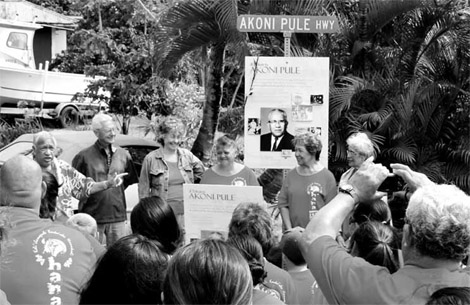 On July 7, members of the Pule ‘ohana joined the staff and directors of the North Kohala Community Resource Center to dedicate a new sign board which explains who Akoni Pule was, his contributions to North Kohala, and why the highway was named for him. 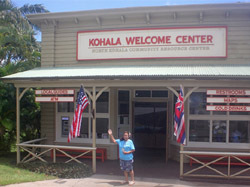 The sign, topped by a green “Akoni Pule Hwy” street marker, was installed outside the Kohala Welcome Center, near Ho’ea Road. The parking area outside of the Welcome Center was awash in red t-shirts as Pule family members, from keiki to kupuna, came together to honor this cherished son of Kohala. Akoni Pule’s nephew, Herring Kalua, led the blessing and dedication, which was followed by the Pule family planting greenery around the sign. Akoni Pule’s granddaughter, Sarah Pule-Fujii, worked together with NKCRC board president Chris Helmuth and executive director Christine Richardson to design the sign, which incorporates photographs and highlights of Akoni Pule’s accomplishments, including his service in Hawai’i House of Representatives. Funding for the sign was provided by a capacity grant from O’Neill Family Foundation through NKCRC. For more information about Akoni Pule, see his biographical article, written by Lani Eugenio, in the November 2011 issue of Kohala Mountain News, which can be viewed at www.kohalamountainnews.com.